How can you keep scorpions out of your home? Chandler scorpion control companies often use scorpion sealing to keep them out of your home. Hiring a company with the right scorpion control methods is vital to prevent them from getting inside your home and stinging you. A number of companies provide scorpion control in Chandler, but few companies have the right training and treatment methods to keep them from coming back. A scorpion exterminator in Chandler will focus on finding the entry points to your home. How are the scorpions getting inside to cause problems? Small entry points around the cable cords and other areas of the home can easily allow scorpions inside the home. The other thing to search for is the food source of the scorpions. Insects around the perimeter of your home can become an excellent food source for scorpions. You need to use Varsity termite and pest control to treat the other pests around the home. If you can eliminate them, you will have an easier time keeping the scorpions away. If you have several scorpions on your property, you can start eliminating them one by one. The best way to do this is at night time with a black light. Their bright bodies will glow under the black light, allowing you to find them and destroy them. The more you kill outside, the less you need to worry about more coming inside the home. Check inside your home with a black light to find if there are some hiding in corners or behind your bed. A scorpion exterminator in Chandler will find all the entry areas where a scorpion can easily enter the home. They will look for holes in the screen doors, cracks in the foundation, and broken weather-stripping around the windows. While these areas may not look large to you, they are big enough for a scorpion or other pests to easily squeeze through. Attics are one area of the home scorpions can get inside and create nests. You must screen the vents leading into your home to prevent the scorpions from coming inside. One of the areas scorpions love to hide is around the large cement and stone walls around most homes in Mesa. A small gap in your fence border will allow scorpions from your neighbor’s home to climb through and get to your yard. Always focus on having the exterior walls sealed as part of the treatment plan. Varsity Termite and Pest Control has the best pest control in the state of Arizona. 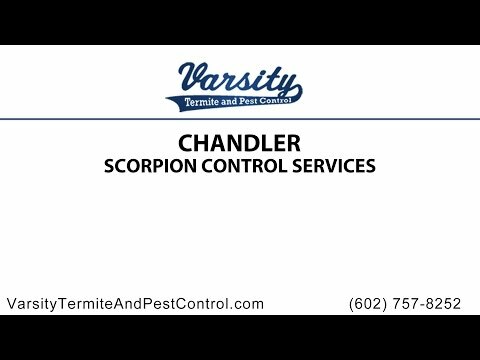 Contact us today to schedule an appointment with us if you need a professional exterminator to come out to Chandler for scorpion control. Visit our website or give us a call if you have any more question or concerns and we’ll be happy to help!